The Ahmedabad District Cooperative Bank secured deposits of Rs 745.59 crore of the spiked notes – in just five days after Prime Minister Narendra Modi made the demonetisation announcement. 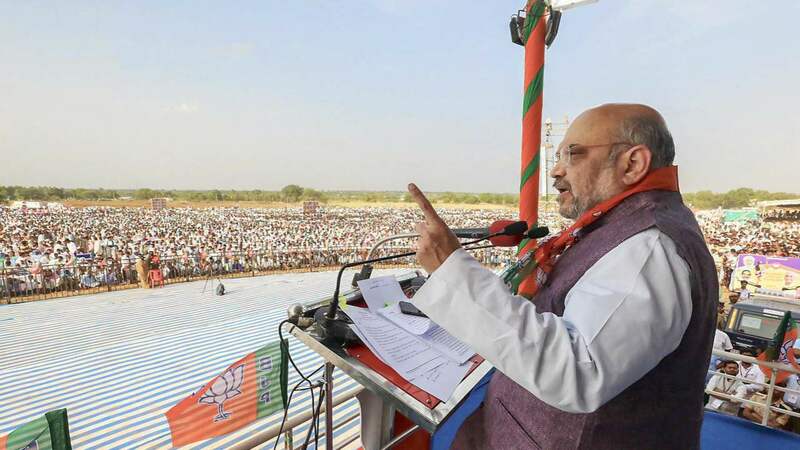 Mumbai: A district cooperative bank, which has Bharatiya Janata Party (BJP) President Amit Shah as a director, netted the highest deposits among such banks of old Rs 500 and Rs 1,000 notes that were abruptly demonetised on November 8, 2016, according to RTI replies received by a Mumbai activist. The Ahmedabad District Cooperative Bank (ADCB) secured deposits of Rs 745.59 crore of the spiked notes – in just five days after Prime Minister Narendra Modi made the demonetisation announcement. All the district cooperative banks were banned from accepting deposits of the banned currency notes from the public after November 14, 2016 – five days after demonetisation – on fears that black money would be laundered through this route. According to the bank’s website, Shah continues to be a director with the bank and has been in that position for several years. He was also the bank’s chairman in 2000. ADCB’s total deposits on March 31, 2017, were Rs 5,050 crore and its net profit for 2016-17 was Rs 14.31 crore. Interestingly, Rajkot is the hub of Gujarat BJP politics – Modi was first elected from there as a legislator in 2001. Incidentally, the figures of Ahmedabad-Rajkot DCCBs are much higher than the apex Gujarat State Cooperative Bank Ltd, which got deposits of a mere Rs 1.11 crore. “The amount of deposits made in the State Cooperative Banks (SCBs) and District Central Cooperative Banks (DCCBs) – revealed under RTI for first time since demonetisation – are astounding,” Manoranjan S. Roy, the RTI activist who made the effort to get the information, told IANS. The RTI information was given by the Chief General Manager and Appellate Authority, S. Saravanavel, of the National Bank for Agriculture & Rural Development (NABARD). It has also come to light, through the RTI queries, that only seven public sector banks (PSBs), 32 SCBs, 370 DCCBs, and a little over three-dozen post offices across India collected Rs 7.91 lakh crore — more than half (52 per cent) of the total amount of old currencies of Rs 15.28 lakh crore deposited with the RBI. The break-up of Rs 7.91 lakh crore mentioned in the RTI replies shows that the value of spiked notes deposited with the RBI by the seven PSBs was Rs 7.57 lakh crore, the 32 SCBs gave in Rs 6,407 crore and the 370 DCCBs brought in Rs 22,271 crore. Old notes deposited by 39 post offices were worth Rs 4,408 crore. Information from all the SCBs and DCCBs across India were received through the replies. The seven PSBs account for around 29,000 branches – out of the over 92,500 branches of the 21 PSBs in India – according to data published by the RBI. The 14 other PSBs declined to gave information on one ground or the other. There are around 155,000 post offices in the country. Fifteen months after demonetisation, the government had announced that Rs 15.28 Lakh crore – or 99% of the cancelled notes worth Rs 15.44 lakh crore – were returned to the RBI treasury. Roy said it was a serious matter if only a few banks and their branches and a handful post offices, apart from SCBs and DCCBs, accounted for over half the old currency notes. The SCBs were allowed to exchange or take deposits of banned notes till December 30, 2016 — for a little over seven weeks, in contrast to district cooperative banks which were allowed only five days of transactions. The prime minister during his demonetisation speech had said that Rs 500 and Rs 1,000 notes could be deposited in bank or post office accounts from November 10 till close of banking hours on December 30, 2016, without any limit. “Thus you will have 50 days to deposit your notes and there is no need for panic,” he had said. After an uproar, mostly from BJP allies, the government also opened a small window in mid-2017, during the presidential elections, allowing the 32 SCBs and 370 DCCBs – largely owned, managed or controlled by politicians of various parties – to deposit their stocks of the spiked notes with the RBI. The move was strongly criticised by the Congress and other major Opposition parties. Among the SCBs, the Maharashtra State Cooperative Bank topped the list of depositors with Rs 1,128 crore from 55 branches and the smallest share of Rs 5.94 crore came from just five branches of Jharkhand State Cooperative Bank, according to the replies. Surprisingly, the Andaman & Nicobar State Cooperative Bank’s share (from 29 branches) was Rs 85.76 crore. While Maharashtra has a population of 12 crore, Jharkhand’s population is 3.6 crore. Andaman & Nicobar Islands have less than four lakh residents. The poorest of all the cooperative banks in the country is Banki Central Cooperative Bank Ltd in Odisha, which admitted to receiving zero deposits of the spiked currency. Of the total 21 PSBs, State Bank of India, Bank of Baroda, Bank of Maharashtra, Central Bank of India, Dena Bank, Indian Overseas Bank, Punjab & Sindh Bank, Vijaya Bank, Andhra Bank, Syndicate Bank, UCO Bank, United Bank of India, Oriental Bank of Commerce, and IDBI Bank (14 banks) — with over 63,500 branches amongst them — did not give any information on deposits. In a spirited and curious defence of ADCB, the National Bank for Agriculture and Rural Develoment (NABARD), India’s apex institution for rural economy credit, noted that all the bank accounts into which the demonetised notes were deposited were verified and checked to see if they had complied with ‘know-your-customer’ (KYC) regulations. “NABARD conducted 100 % verification in Ahmedabad DCCB which revealed that the bank had complied with all the KYC Guidelines of the RBI while accepting the demonetised notes,” it said in a statement released on Friday afternoon. “As per the verification report of NABARD, required under the extant guidelines, the bank had also submitted the required Cash Transaction Reports (CTRs) and STRs to FlU-India wherever required,” it added. The agricultural and rural institution also curiously makes two other points in defence of ADCB. Firstly, it notes that district central cooperative banks in Gujarat received less demonetised notes when compared to their counterparts in Kerala and Maharashtra. Secondly, it notes that the amount of money that was deposited in the days after demonetisation in ADCB was in complete “proportion to the size and number of accounts in the bank”. “Of the total 16 lakh accounts with the DCCB, deposits/ exchanges were made only by 1.60 lakh customers i.e. 9.37% of the total deposit accounts,” NABARD’s statement notes. Out of these 1.60 lakh customers, less than Rs 2.5 lakh was deposited in 98.66% of the accounts. Out of the bank’s total accounts, 0.09% of accounts saw deposits above Rs 2.5 lakh made. “The average deposit amount in Ahmedabad DCCB was Rs. 46,795 which was lower than average per depositor in 18 DCCBs of Gujarat. During this intervening period 1.60 lakh customers of the bank deposited/ exchanged demonetised notes aggregating to Rs 746 crore which was only about 15 % of total deposits of the bank,” the statement emphasises. Note: This article has been updated with NABARD’s response.